A swinging hammock amongst tall tropical trees. The squawk of a parrot screeching for attention. The sound of rushing water cascading down a stairway of rocks. You don't have to be in Hawaii to enjoy a tropical paradise or in the Amazon to explore a jungle. Just create one in your own backyard. 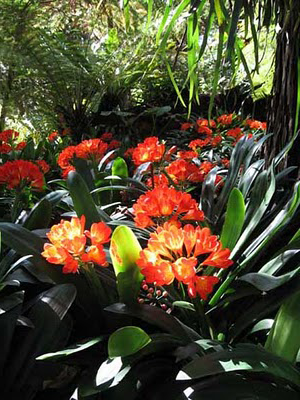 Because of the exotic nature of tropical gardens, your paradise will need careful attention. But if you have a passion for gardening and love the feel of the tropics, then all the attention needed will just be a part of your little heaven. Gardens that are in warmer climates will have a much easier time choosing their plants and enjoying them year round, but that does not mean that Northerners have to be excluded from enjoying a tropical escape. If your garden is climate-challenged for that jungle feel you can take some extra steps to create your vision. Most importantly, first do your research on the adaptability and hardiness of plants before you make any decisions for your design. Plants that need to be moved indoors during the winter can be planted in containers of any size – just add some wheels at the bottom for easy movement from the outdoors to the indoors. Northerners can also make their garden more tropical by adding garden furniture and décor that are undeniably tropical. A swinging hammock, teak, bamboo or rattan furniture, flaming tiki torches, waterfalls, fountains depicting tropical birds, statutes of jungle animals, and even a live parrot in a bird cage multiplies the tropical feel without adding climate-sensitive plants. For a tropical garden, you want an overgrown selection of plants that are large, tall, imposing, hanging and textured. Spider plants, snake plants and banana plants are a must – as much for their looks as for their names. Palms and ferns should be plentiful. Bamboo plants should announce their presence with plants, bamboo water fountains and bamboo furniture. Flowers should be colorful and sculptured. Orchids and Irises can add to the tropical feel, as well as birds-of-paradise, crotons, princess flowers, fastia and bromeliad. Elephant's ear, ginger, citrus trees, hibiscus, dwarf papyrus, and bleeding-heart vine are just a small sampling of other plants that fit nicely into a tropical themed garden. Tropical gardens are lush, bold, colorful, and full of hidden surprises. Hide some ponds inside a circle of thick vegetation. Create a tree house for bird watching. Surprise guests with fresh edible fruit ready to quench their thirst. Hammocks, deck chairs, and beach furniture can welcome guests to sit and relax on their long walk. A table display of coconuts makes a festive centerpiece, and cocktail umbrellas should accompany your home-made fruit punch. Even an etched-on anaconda down a stone stairway, or a pet iguana lurking behind a corner can add a hidden element of surprise. Be beautiful, and be daring. Paradise doesn't have to be a cruise ship away. You can escape to a hammock with a good book and a fruity cocktail in your hand without having to worry about getting seasick. Sit inside on a rainy day and research your tropical choices. When the warm weather comes, you'll be prepared to start growing a little paradise of your own.